In his latest narcissistic rant Shaun King, once again, uses his position as a Senior Social Justice writer for New York Daily news to defend himself against anything negative said about him on Twitter or (lol) Fox News. 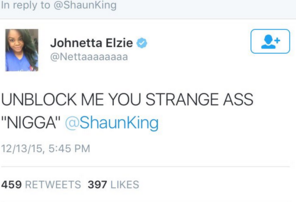 After the following background on the Black Lives Matter/Shaun King twitter drama you will find our rebuttal to King's latest NYDN manifesto.. Here's the thing – I don't do lunches with politicians, dinners at the White House, or photo ops w/ celebrities. I expose injustice. When we are at the White House or with celebrities, they aren't photo-ops. 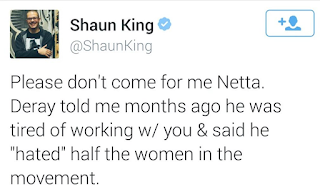 We are always talking about the movement & black folks.
.@ShaunKing will attack me, build a website about himself, & write a 10,000 word Facebook post before offering substantive answers. 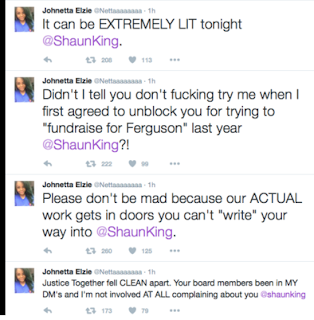 "Despite the pain, I won’t stop writing about police brutality and injustice in America - "In July of 2014, I was actually working full-time managing social media and communications for a charity in Los Angeles. Our office was a block from the beach in Santa Monica. The staff was friendly, the work they did was impactful and life was pretty good." "My Decision to Become a Full-Time Coach. As you may know, I’ve spent the past 3+ months with my family living in South Africa, Paris, and London. During this time, for the first time in my adult life, I transitioned out of every job and commitment and business venture I have so that I could properly position myself to guide people through life for a living. It’s my passion. It’s what I love and I’d like for you to consider making me your coach and guide through life." 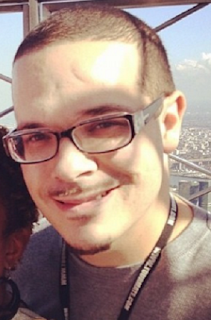 There's zero evidence King had an actual job in the 1 1/2 months prior to Mike Brown's death. 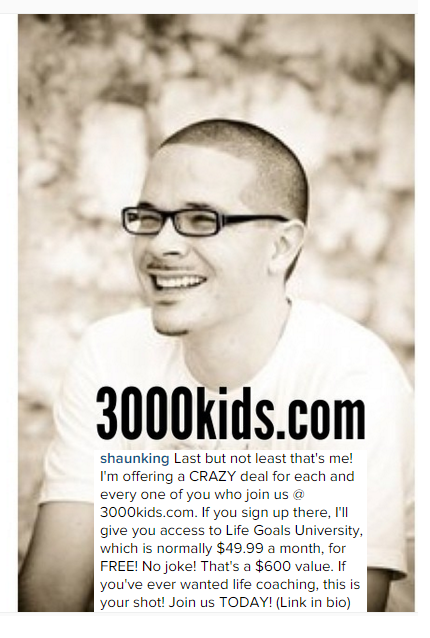 He had started another fundraising site, 3000kids.com - people gave monthly donations to sponsor children. He abandoned this effort in early August - the website is now offline. "I started this petition just a week after Mike Brown was killed and worked day and night to get over 250,000 signatures on it for practical reforms that were needed to end police brutality." 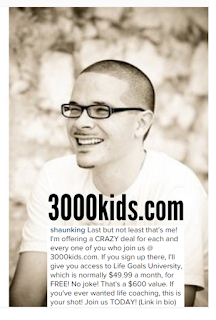 "Dream Defenders started this petition with a single signature, and now has 260,510 supporters. Start a petition today to change something you care about." King states in his article that he wasn't happy with what happened to Trayvon Martin, he fails to mention he did a quick fundraiser for him that netted about $2,000 - this was AFTER the trial. 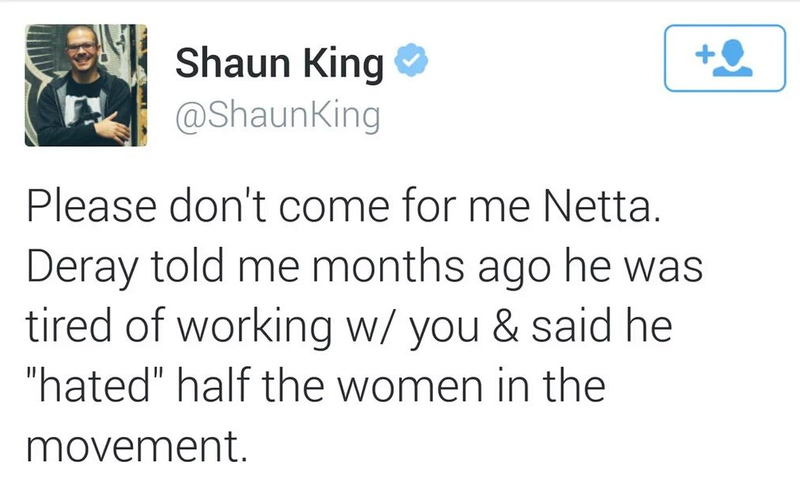 Sybrina Fulton and Tracy Martin were pretty much set by then financially. Benjamin Crump and Sybrina have been asked if they received these funds, no answer has been forthcoming at this point. King was asked many times to provide the horrific photos of his kids and the death threats he claims to constantly receive,..instead of showing them, he would quickly block anyone who asked, or in my case, had them suspended. "People were posting death threats, posting my home address, making memes of photos of my kids being killed, speculating where I worked and where my job was located. Soon, on social media, on weird blogs I had never heard of before, on message boards I never knew existed, I was the primary topic of discussion. People hated me. They openly said so." Always the victim card followed up with irrational posting of his endangered children all over his facebook and public twitter page - photos of he and his kids attending ball games (real time), Halloween, going to restaurants, etc.,. "The more I wrote, the crazier life got, the more threats came in, the more lies folk told." "Conservatives then created the lie that I stole money from Tamir's family. I wasn't prepared for that one. Somehow, that lie has endured to this very day." What you were accused of, and I know because I am the one who called the Rice family attorney, was starting the fundraiser without the family's knowledge. I was told by said attorney that he was not aware of who you were or that you had started the 1st fundraiser - he quickly had it shut down before you could take your cut from it. The funds were moved to the Rice trust. Later the attorney petitioned for their OWED fees from Samaria Rice after she hired Benjamin Crump - which was coincidentally, the night before you started the fundraiser. Anyone can put 2 and 2 together given that last bit of information. By the way, constantly calling me and my site "white supremacist and conservative" indicates you feel only a conservative site would out you with the truth... I guess Goldie Taylor proved you wrong today boss.